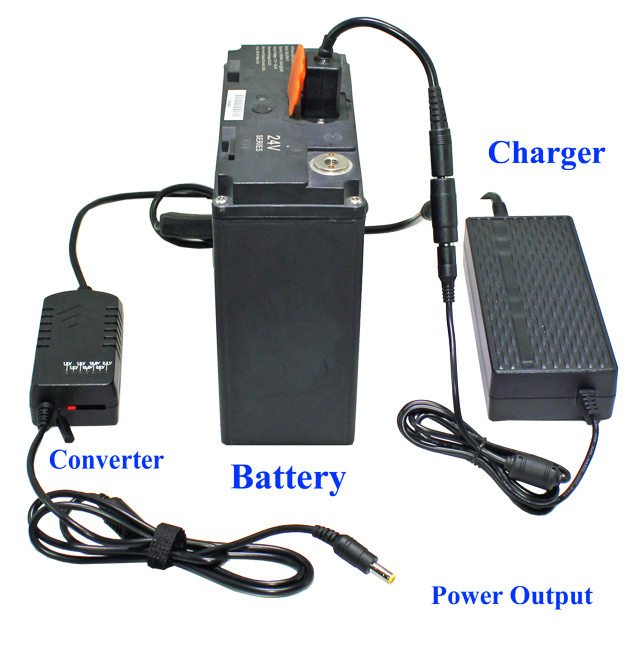 This UPS system is very simple to use, just connect battery AC charger and output cable to battery with supplied special charge port adapter like picture below. The system can support uninterrupted DC power up to 4 Amps continues output. When AC Charger can supply maximum 4 Amps current, which can fully charge battery from empty in around 7 hours when not using battery. When using battery, if the power demanding from battery is less than 4 Amps, the power AC charger will directly pass the power to battery output and at same time use rest power to charge battery. When power demanding is more than AC charger can supply, the battery will provide rest power to meet power demanding. The battery can supply 3 Amps power up to 8 hours when AC power is out of power. Connect output cable to one of 5.5 x 2.5mm Female output port on charger port adapter. Connect charger to another 5.5 x 2.5mm female port. If you need large power ( more than 6 Amps) from battery, please get power from output terminals. It can fully charge the battery in around 6 ~ 7 hours. This battery output voltage range is 21V ~ 29.5V. 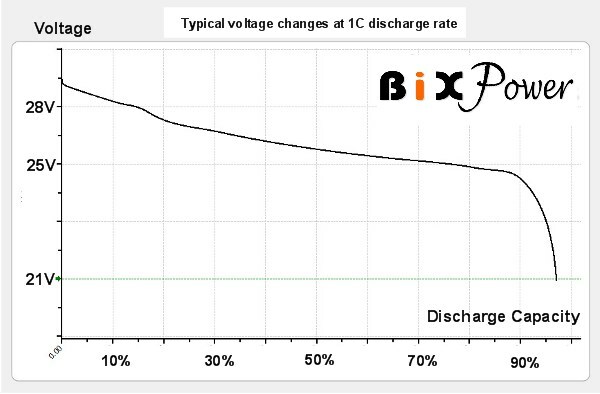 This output voltage can be converted to different voltages to meet different needs by using optional BiXPower DD90X DC to DC power converters. DD90X Power converter can connect to battery with enclosed connection cable that has an on/off switch to provide regulated output voltage. 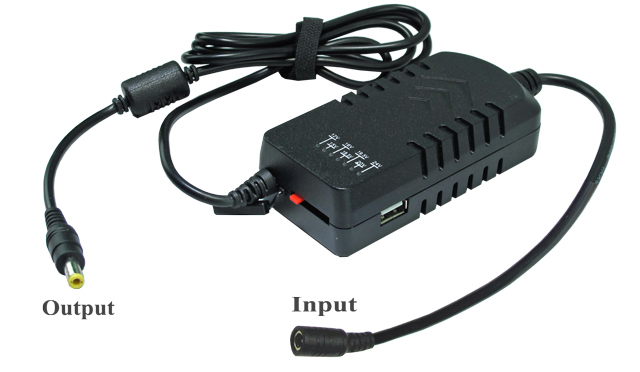 This optional DD90X DC to DC power adapter can convert battery power to 12/15/16/18.5/19.5/24v voltage DC output power for laptop/notebook computers, tablet computers or other devices. This DC power adapter can accept 10V ~ 30V DC power, it can be used with many of our BiXPower 12V, 16V, 19V and 24V batteries. 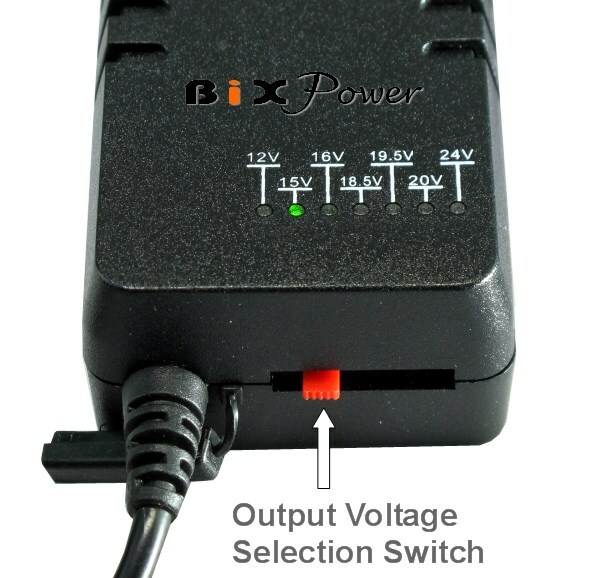 If this connector does not fit your device, you can use BiXPower C series connector tips to change it to many different size connectors.